Despite clutching our phones all day, few of us give much thought to what they’re made of, let alone why or how. Linda Jiang can tell you a story about materials—their characteristics, functionality, production cycles, and how they can make or break an experience for the user. As Head of Industrial Design at Essential, the latest venture from Android creator Andy Rubin, she was tasked with a massive challenge: building a standout smartphone with a minuscule team. The Essential mantra is all about simplicity—and eschewing the tendencies of competing brands (Rubin makes as much clear in a blog post on the company’s founding principles). The phone has no logo. It doesn’t force any apps on users, works with an open ecosystem and promises to evolve with updates, rather than become outdated each year (ahem, Apple). 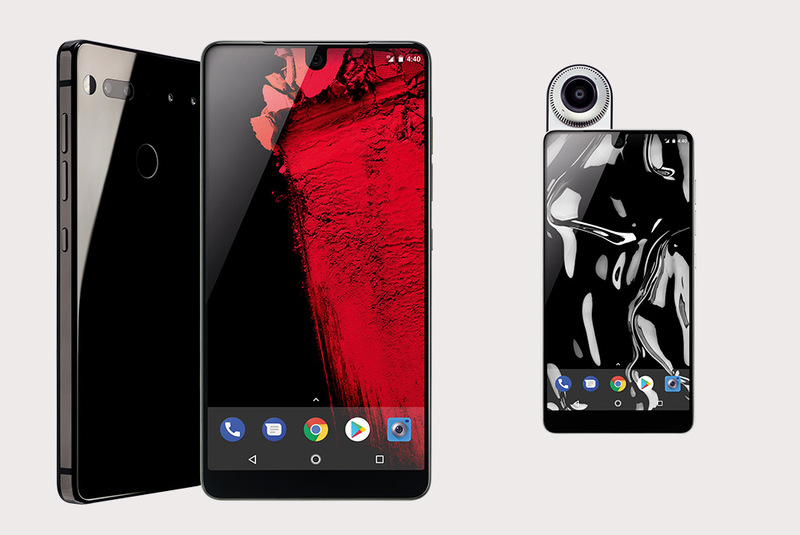 Essential also aims to up the game with a line of advanced accessories that adhere to the phone with magnets; the first is a tiny 360 camera for photo and video. Jiang visited PSFK to demo the phone and talk about bringing her design from concept to customer. I feel like being tasked with designing a new smartphone at this point is like being asked to reinvent the spoon—every user needs it to be a certain way, follow these parameters. Where did you even begin to approach that task? It was definitely hard. Especially because I came from Motorola prior to joining Essential, so I had already been doing this for five years. Then when I joined Essential, I was like, okay, we’re going to do a smartphone again. It’s a pretty cutthroat industry; obviously there are two dominant companies and everyone’s just kind of chasing what they’re doing. But I think for us, we didn’t want to go the normal Android route where we try to do what Apple does, let’s say, and do it cheaper so it’s more affordable and kind of skip the corners a little bit. We didn’t want to do that. I think what made me really want to join Essential was our founder Andy [Rubin]. He had this vision of, I created the software, now I want to create the hardware that matches what I envisioned for the software. He really pitched us on, let’s not follow the norm, let’s figure out what are the difficult things to do in the industry and try to tackle it. So when it came to materials, we chose the materials that normally would get passed on because they’re so much harder to machine, but they’re so much more premium. When it came to technology, we spent a lot of time and energy working with our vendors and gaining trust among us because a lot of times with a new technology like three-sided borderless display, the vendors can’t make a lot of these, like on an iPhone scale. They can’t make 10 million of these or 15 million of these. They can do it in low quantities but they can do it really well. So we have the perfect partnership. We’re a small company; we’re not aiming to sell 10 million of the phones. But we want to showcase your technology and what you can do on a smaller scale, all the great advancements you can make. We were able to develop those kinds of relationships and really be able to leverage our vendors, our suppliers, everyone on board with what we were trying to do. And I think at the end of the day, we try to use those relationships and our little advantages to make our device a little bit better than what’s already on the market and a little bit different than what’s already on the market. It feels pretty great to know that we came out with the three-sided borderless display first, and then Apple kind of followed suit—I felt really vindicated to realize we were going in the right direction. Exactly. We’re not trying to sell 10 million phones, we’re just trying to sell enough phones for people who are willing to try something different to come on board. We’re not trying to take over Apple or take over Samsung. That was an advantage for us because these vendors were able to help us better, I guess. They were able to provide us with technologies and parts that were not available if we were to try to sell on that kind of scale. Could you tell me a bit more about the phone materials—the titanium and ceramic? One thing we tried to do with the device, overall with all the design details, was to try and let the technology speak through. It was always technology forward. We chose all the little details, including materials, to help better tell that story. The reason we chose titanium is because of how stiff it is. When you have borders that are this thin—compared to what iPhone is doing—when you have borders that are that thin, your display is pretty fragile to drop. Not just the glass but the actual display panel itself when you drop it, and that’s when it gets hard to repair. You can’t just take it into a repair shop and get the glass changed. So we chose titanium because it’s stiffer so when you drop it, it flexes less than aluminum, so therefore it pretty much protects the display from any sort of impact or damage from bending or anything like that. We also chose ceramic in a very similar fashion. We have a lot of components going on in the back of the phone that require RF open windows in certain areas, like the NFC, the fingerprint sensor, what we’re calling the click connect system—they all require some sort of material that radio frequency can pass through. 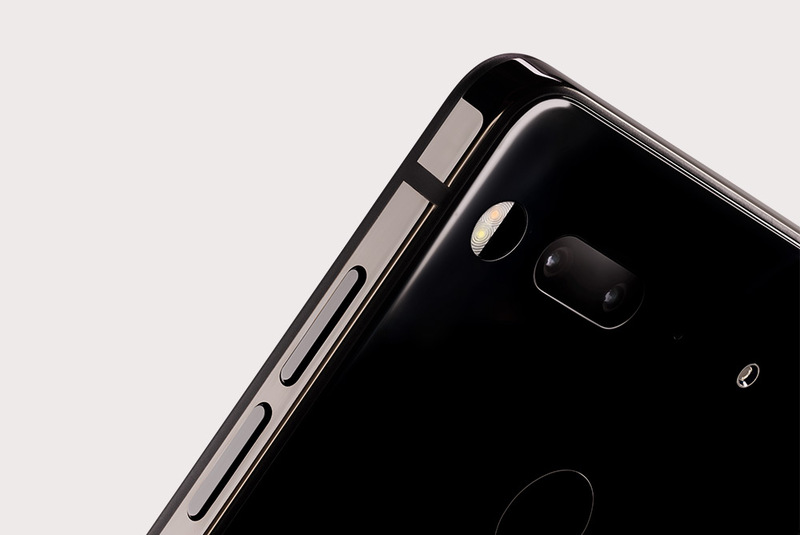 When we chose ceramic, it was the best of both worlds because it looked beautiful and it worked for those technologies so that we didn’t have to put holes all throughout the back of the phone. Ceramic is a very tough material to work with, and a lot of companies have tried. It’s very scratch proof, but if you can imagine a porcelain bowl, it will shatter. So a lot of companies can’t use that material because the frame is aluminum and it’s not strong enough to protect it. Because we were using titanium we were able to use that strength to protect the back as well as the front, which was great. Everything just came together in a whole package. When you prototype do you go through all of the different materials? We definitely do. When we first started this we weren’t sure what the material would be, we just knew it can’t be aluminum because it’s too soft. We’ve prototyped with stainless steel, we’ve prototyped with crazy, crazy materials that we would never use, like copper. We looked into materials that were strong but they were industrial materials, and they just could not have that nice beautiful finish at the end. I think at the end we came down to titanium because it was the best of all worlds. It was beautiful, it was strong, it was stiff, it was light, and we were able to figure out a way to machine it in a very efficient manner so that the cost isn’t added onto the product. What was the process behind deciding not to have a logo? There were a lot of factors that went into it, actually. One of the main reasons is companies like to put their logos on the back of the phone so when users are walking around talking on their phone, the user pretty much becomes a walking advertisement, and we didn’t want to force that onto our users. You bought our phone because you have a personal relationship with the device; we don’t need you to then sell for us, or go out there and be advertisers for us. That’s not what we aim for. Another reason was just because we felt like our device looks so different from the back that there was no reason we had to differentiate—when people realize they should recognize that’s the Essential phone. The third reason is just because there are a lot of requirements when it comes to branding—I think Apple’s the only one that can get away with [not doing] it—when you work with carriers, when you put your logo on it, that means they get to put their logos on it. So Verizon’s check or Sprint’s logo or T-Mobile, there’s usually a requirement that any time you have your logo, [their] logo gets to be somewhere. Usually on Samsungs it’s on the front of the phone. It’s because the carriers are putting in money, they’re giving you advertising money, they’re giving you resources, and they want to display their brand as well. For us, it’s like screw it—we’re not going to put ours on there because we’re not going to force you to have a Sprint logo on your phone. I think that was one of the major reasons why. For us, it was just like, yeah, we want to promote our company but we want you to enjoy our product more. Can you talk about your 360 camera attachment, which is very unique, and other accessories? With our accessory story, in terms of design for our phone, we really wanted to focus on something that was sophisticated and clean that looked very premium and modern. That’s why there are very small details; it’s mainly just one color. But for our accessories, because they’re showcasing pretty advanced technology and a lot of times it’s for fun functions—social functions—like a 360 camera, we wanted the design to feel a little more friendly, a little bit more playful and kind of expressive. I think you’ll see that in all of the later on accessories that come out. We try to put a little bit more playfulness into these little things. It was hard figuring out the magnet system because it has to be strong enough that it stays really secure, but it has to be loose enough that you can take it off easily. So our engineering team spent months just figuring [that] out, and we had consultants and outside freelancers—we called them magnetos—who would come in and explain to us what kind of magnet we should use, what force and all that. How did you arrive at the rectangle shape for the phone? I see in some of your early drawings it’s a bit more bubbly. I think that goes back to the idea of letting the technology come forward. We looked into things that were a little bit more rounded, we looked into things that had way more rounded corners, larger radii in the corners, but then with the three-sided borderless display, you want it to read really, really borderless. When you add rounds on the sides, it means you’re making the borders look fatter. When you’re cutting the corners super round, it means there are less pixels in the corner. We actually did a lot of studies just to figure out how much of an edge round we can have before it starts to read like the borders are getting thicker, and then we made I think 20 prototypes on different corner radii to figure out what’s soft enough where it still feels very friendly and human, but just hard enough so there are enough pixels pushed all the way to the edge. I don’t think people realize how much work goes into just small details like that. There’s actually one [other] part that most people don’t know—we went through a huge study on ceramic colors. I spent a month or two just looking at colors for ceramics and went through forecasting for color range, lights and darks. I didn’t want to associate ceramic with just any plastic or any glass, I wanted it to read like ceramic, like something you have in your house, antiques that you carry down. So I chose colors that I thought expressed that a little bit more, your terracottas, your deep blues, your greens—things that feel a little bit more natural. Then we went to Japan to figure out how many of these colors we can do, and I had no clue how hard it was to make ceramic colors. Just to get a chip—just to get a color chip—it took like three months because the process, it’s not what I expected. It’s not like paint where you mix black and white and you get grey, or you mix blue and yellow and you get green. It wasn’t like that at all. It was more of a ceramic glazing; it’s like a chemical reaction that happens that creates the color, so if you mix black and white, you might get yellow, or if you mix yellow and blue you might get pink. So I [asked], can you make me color chips of these colors? And they’re like, well, that will take years because it’s a trial run. We have one person who makes a little bit of powder and makes a little bit of powder, bakes it for 24 hours—nope, that’s not it. It’s all process of elimination to get down to that color. So we ended up working with our powder vendor for a few months, and we got this really, really nice blue color to work that was stable. Even with this blue, from batch to batch, it might differentiate a little bit, depending on how long you bake it for, the temperatures, all the environments of what they call an oven, it might change the color outcome. When I say oven, I don’t mean like a little oven you put one thing in—this is a half-mile long tunnel of oven and it takes days for it to go from one end and out the other, and it just bakes in there the entire time.